Located in the small village of St-Ephrem de Beauce, about 50 kilometres west of Quebec’s border with Maine, the Clermond Hamel sawmill is run by the fifth generation of the Hamel family—a bit of a rare phenomenon in business and even more so in a forest industry now dominated by large companies. Though it has been selling around 75 million board feet of dimensional lumber annually in recent years, the mill has still had to fight for profitability, a familiar industry scenario. They have, however, decided to seize a business opportunity and start a brand new division. In addition to their conventional lumber market, they also now focus on wood products for log home construction. Alphonse Hamel was a supplier for the French Catholic colonials who arrived with great hope to live on land newly granted by the province. He built a sawmill in 1890 that processed timber in the surrounding area. From 1935 to 1957, his son Adjutor took over the business, but also started production of cedar shingles. Then Clermond Hamel and his wife Louisette Rodrigue started an era of modernization, with a number of improvements. In 1990, Carmin and Lucie, their son and daughter, made significant investments such as the purchase of kilns, and automated equipment to process spruce, red pine, tamarack and hemlock from private woodlots in Quebec and New England. The Clermond Hamel sawmill: still a family operation. In front is company CEO Carmin Hamel and his wife, Lucie. In the back are France, David and Nicolas Hamel. The focus has been on diversification with a sawmill, a planer mill and the brand new log home division, the last representing a $1 million investment. During the last decade, the fifth generation has arrived. Carmin’s children. France, 32, works on business operations, David, 29, is responsible for the sawmill operations, and Nicolas, 25, is in charge of the new log home construction branch, Bois Hamel. Today, about 80 employees work in the entire organization, on two shifts, five days a week. 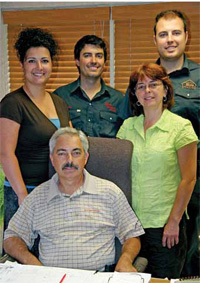 The core business remains lumber production, and the Hamel family puts emphasis on product diversification and very personalized customer service. “We still offer standard products, but we also specialize in the very small orders, and have the capacity to offer pieces of various dimensions very quickly. A contractor who needs 50 beams of 8 X 8 by 16 feet length will receive his order in less than two days,” explains Carmin Hamel. This market may not be huge volume, but they want to be the “go-to” mill for this business. “We take any orders. We can help someone who only needs two logs for his cottage—we are small enough to do this,” adds Nicholas, Carmin’s youngest son. And what about the wood supply? Over 110 years ago, the wood came from the surrounding forests. Clermond Hamel then had to find his supply in the far north of Quebec in the 1960s, through to the 1990s. “Today, with the work that’s been done during the last few decades, volumes and quality have really improved, but some producers should still let their trees grow a little longer. They are still too small,” explains Carmin. Consequently, the family looks south of the border for almost half of their supply. “About 60 per cent of our spruce, hemlock, fir, red pine, and tamarack come from Quebec but since the local woodlot owners cannot meet all our needs, the remainder is bought in New England,” he says. The company is Customs-Trade Partnership Against Terrorism (C-TPAT) accredited—a voluntary supply chain security program led by U.S. Customs and Border Protection—because the business sells its products in the U.S. The fact that they sell lumber in New England actually helps to decrease their overall transportation costs. 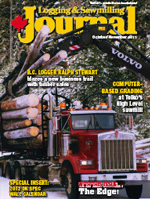 “When we ship lumber to our clients in the U.S., our broker can come back with a load of logs,” Carmin adds. Though the Clermond Hamel sawmill has been selling around 75 million board feet of dimensional lumber annually in recent years, the mill has still had to fight for profitability, a familiar industry scenario. They have strived to be efficient as possible, implementing regular equipment upgrades to the mill. Over the years, upgrades have been made to the mill. In 2003, the Hamel family invested in a new canter twin line made by PHL and optimized by Autolog, an investment of $5 million. There was an existing 30” USNR Cambio debarker, and a MDI TWA 2000 metal detector and an 18” USNR has been installed, plus three Comact conveyer step feeders. The canter twin line processes up to 450 ft/minute, and it can cut wood up to 18 inches in diameter. “This is the most current model we have. It can also process 18 logs/minute in scan set mode,” says Steve Hamel, PHL’s vice-president of engineering, research and development. A manual double cut headrig made by PHL in 1982—that was customized in 2003—now processes around five to six pieces/minute. It’s followed by a resaw and two edgers, one of which is manual; the second edger was optimized by Autolog and can process 40 pieces/minute. In addition, the line counts an 8” canter bull, also made by PHL and optimized by Autolog. Pieces are then transported to a PHL trimmer that was upgraded in November 2006. 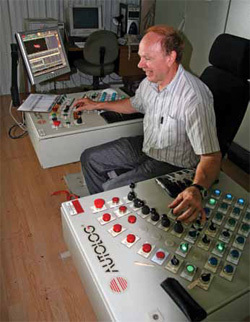 Another upgrade was made in December 2010 on the canter bull, increasing its accuracy. 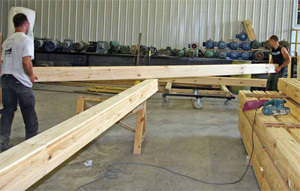 A lumber sorter, followed by a stacker—both supplied by PHL—and strapping equipment from Samuel ACME complete the production line. Two PHL chippers, 60” and 48”, process chips with a Jeffrey Rader system. The sawmill has five MEC kilns for a total capacity of 700,000 board feet. The heating system counts two boilers, a Freco and a Co-breyne, that run with sawdust. There is further PHL equipment in the the planer, with a trimmer and stacker. In the yard, operations such as transportation to the kilns and the entire sawmill are carried out by five Volvo L120 loaders, and a Volvo L150 is assigned to the sawmill itself. Because the Hamel family wants to further diversify, it has the new division that produces grooved red pine and spruce beams. This product is mainly targeted at retailers, but also to consumers. This product idea came from a simple visit to a trade show. “We noticed that there were a lot of log home contractors who offered to built a turnkey project, but there wasn’t anyone selling custom pieces for consumers who want to build log homes themselves or simply wanting the wood for renovations and improvements,” says Carmin. Since the economic situation remains challenging for the industry, the Clermond Hamel sawmill has had to be imaginative and resourceful. Their core business remains lumber production, and the Hamel family puts an emphasis on product diversification and very personalized customer service. Called “Bois Hamel”, the new business unit produces pre-cut wood, solid wood paneling, cladding, and floors that have that “log home” appearance. This past July, the family finished a new 10,000 square foot building, that includes a new Weinig Power 2000 XL molder. Other equipment for the new facility has been bought used or reconditioned. The plant includes a Sylver SHB 900 resaw, and a Griggio sandblaster. The Hamel family strongly believes in the benefits of this latest project. And how has the response been from customers? “People hear about us by word of mouth most of the time. For now, we don’t want to invest into home decorating magazines yet—we prefer to advertise our products on specialized websites such as “Les PAC”, which is much affordable. Our own website has also brought us new customers,” says Nicolas. This new initiative is being helped by a designer who has been hired recently. Her job: make drafts and plans for customers who may only want to do small renovations—or help with constructing a turnkey project. For more than a century, the Hamel family has been running this business. At 58, Carmin is slowly preparing his retirement, while the fifth generation is settling in. Today at 88 years, Clermond Hamel, the patriarch, still lives in his house adjacent to the administrative offices of the sawmill, keeping an eye on the business to which he dedicated his life—and hoping that the family will run the business for another century.